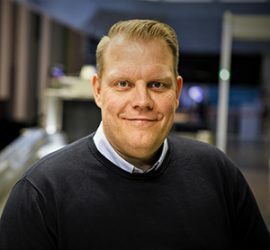 Hjalti S. Hjaltason is a Project manager at Vanderlande since September 2018. From 2015-2018, he was Supervisor for Security screening equipment at Keflavik International Airport (KEF), Iceland. There he gained operational experience and insight into new and improved aviation security solutions, leading the automation and optimisation development of Keflavik´s security checkpoints (passengers and staff). From 2011-2014, Hjalti worked as a manager of Sales/Account management at Míla ehf. Prior experience includes project management, sales management and key account management roles. Hjalti has a M.Sc. degree in International marketing & Brand management from Lund University (Sweden) and a B.Sc. degree in Business administration from the University of Akureyri (Iceland).